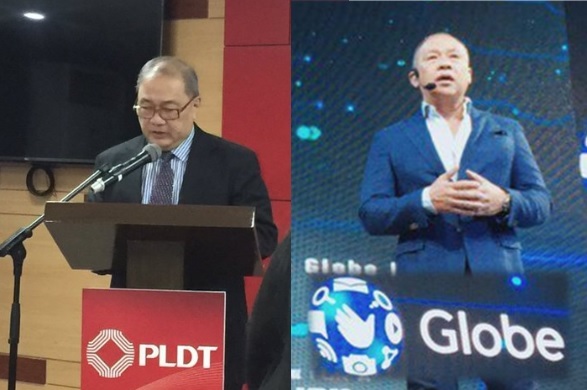 MANILA, Philippines - Dominant carriers Philippine Long Distance Telephone Company (PLDT) and Globe Telecom Inc. (Globe) officially announced today the acquisition of the telecommunications business of San Miguel Corporation (SMC) by 50-50 share basis. This milestone in the telecommunications industry highlights PLDT and Globe's access to valuable 700-megahertz spectrum, a frequency that covers more ground and penetrates indoors to significantly improve Internet speed, quality and coverage. PLDT Chief Executive Officer, Manuel V Pangilinan, said, "This transaction offers a breakthrough opportunity, not only for the companies involved but also for the industry and the country. This will enable existing operators to provide significantly improved Internet and data services to the public and to our customers in the shortest possible time." "Buying SMC's telco/frequencies to provide "much needed capacity to improve mobile browsing speeds," Globe CEO Ernest Cu said. The consideration for the acquisition of the SMC telecommunications business is PHP69.1 billion which includes PHP52.08 billion for 100% equity interest in Vega Telecom, Inc ("Vega Telecom") and the assumption of around PHP17.02 billion of liabilities. Vega Telecom owns controlling interests in Bell Telecommunication Philippines, Inc, Eastern Telecommunications Philippines, Inc, Cobaltpoint Telecommunication, Inc (formerly Extelcom), and Tori Spectrum Telecommunication, Inc (formerly Wi-Tribe), and Hi- Frequency Telecommunication, Inc. The consideration for the acquisition of New Century is PHP691 million which includesPHP576 million for 100% equity interest and the assumption of around PHP115 million of liabilities. Total consideration for the acquisition of eTelco is PHP206 million which includes PHP191 million for 100% equity interest and the assumption of around PHP15 million of liabilities. The equity portion of the consideration for Vega Telecom, New Century and eTelco is PHP52.85 billion on an aggregate basis and will be paid in three (3) tranches. The First Payment of 50% will be made upon signing, the Second Payment of 25% six (6) months after the First Payment, and the final 25% at 12 months after the First Payment. PLDT will pay 50% of the equity portion of the consideration to acquire its 50% equity interest in each of Vega Telecom, New Century and eTelco. The liabilities of PHP17.15 billion will be assumed by PLDT and Globe upon signing. In a statement, San Miguel Corp. CEO said the move is a sacrifice to harness the full potential of having faster Internet speed in the country. This Acquisition will provide significant benefits to PLDT, Smart, TNT and Sun Cellular customers, further improve Internet and data services for the public, and speed up the country's overall development efforts. Following the Acquisition, customers will progressively experience faster Internet and higher call and data quality across the fixed and mobile networks of PLDT and Smart. Capacity and coverage, both indoor and outdoor, will be expanded and enhanced. This will enable PLDT to provide attractive mobile connectivity and digital services to its consumer and enterprise customers at affordable prices. Stronger networks and connectivity are key enablers for individual and enterprise sector productivity and cost efficiency. Access to these much-needed radio frequencies, especially the 700MHz, is likely to raise PLDT's capex by US$1 00 Million for 2016 and 2017. The rollout of service on the 700 MHz will be accelerated, allowing PLDT's fixed and wireless subscribers to enjoy the significant benefits of this frequency at the soonest possible time. The additional spectrum will result in wider coverage and more efficient network utilization. This will enable PLDT to pursue a growth-focused expansion of its network and extend Internet services to a larger number of customers in more areas of the country. In particular, Smart will be able to serve better the regional and rural areas of the Philippines by utilizing the 700MHz spectrum. This will help bridge the Digital Divide in the country and create more opportunities to utilize digital technologies to promote rural development. In addition to the 700MHz frequencies, PLDT will also receive supplementary frequencies in the 900MHz and 1800MHz bands which will enhance our current networks and increase capacity, resulting in faster and improved data services. frequencies in the 700 MHz, 850 MHz, 2500 MHz, and 3500 MHz bands and to return these radio frequencies to the Government through the National Telecommunications Commission ("NTC"). These radio frequencies to be returned by subsidiaries of Vega Telecom to the NTC will be sufficient, together with radio frequencies already held by the NTC, to allow for a third-party operator to enter the market. The Acquisition will thereby help the NTC and the Philippine Government provide for a better utilization of available radio frequency spectrum for mobile services, which will benefit consumers more quickly. PLDT intends to finance its portion of the Purchase Price primarily through proceeds from the sale of 25% of its equity interest in Beacon Electric Asset Holdings Inc. ("Beacon Electric") to Metro Pacific Investments Corporation ("MPIC") for total consideration of PHP 26.2 billion with the balance coming from a combination of new debt and balance sheet cash. MPIC will pay PHP17.0 billion in cash immediately on completion of the transaction and the balance of PHP9.2 billion in installments over the following four (4) years. Beacon Electric is a special purpose company owned 50-50 by PLDT and MPIC. Beacon Electric holds a 35% interest in Manila Electric Company. "It leaves the door open for new entrants into the industry. Taken together, this will enable the industry to better support the country's development efforts - especially significant with the onset of a new Government," MVP added.